This recipe is straight from my mother’s kitchen. 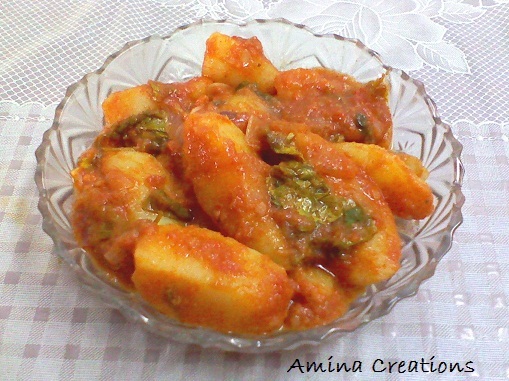 It is very easy to prepare and goes well with chapathis, rotis, and dosas and also as a side dish with rice. You can even use it to make a sandwich. Heat oil in a pan; add onions and sauté till it turns golden. Then add garlic paste and ginger paste and sauté for a minute. Then add tomato puree, red chilli powder and salt. Mix well and cook till the raw smell goes and oil separates. Finally add potatoes and coriander leaves. Mix well and cook for a minute. Then add water and chaat masala and bring to a boil. Then reduce heat, close a lid and cook for 7 to 8 minutes. Garnish with coriander leaves. Serve hot.